황금고양이속(Catopuma)은 고양이과 고양이아과에 속하는 속 분류군이다. 아시아황금고양이(C. temminckii)와 보르네오황금고양이 (C. badia)의 2종으로 이루어져 있다. 2종 모두 일반적으로 불그스레한 갈색을 띠며, 머리에 좀더 진한 얼룩무늬가 있다. 동남아시아 숲 서식지에서 살며, 보르네오황금고양이는 보르네오 섬에서 제한적으로 서식한다. 초기에는 같은 종에 속하는 2종의 아종으로 간주했지만, 최근의 유전학적 계통 분석을 통해 2종을 별도의 종으로 확인했다. 2종은 보르네오 섬이 인근 섬들과 분리되기 전인 490~530만년 전에 서로 분기되었다. 황금고양이속과 가장 가까운 종은 마블고양이로 2개 속의 공통 선조는 약 940만년 전에 분기되었다. ↑ Wozencraft, W.C. (2005). 〈Order Carnivora〉 [식육목]. Wilson, D.E. ; Reeder, D.M. 《Mammal Species of the World: A Taxonomic and Geographic Reference》 (영어) 3판. 존스 홉킨스 대학교 출판사. 533–534쪽. ISBN 978-0-8018-8221-0. OCLC 62265494. ↑ Sunquist, Mel; Sunquist, Fiona (2002). 《Wild cats of the World》. Chicago: University of Chicago Press. 49쪽. ISBN 0-226-77999-8. ↑ W. E. Johnson; 외. (1999). 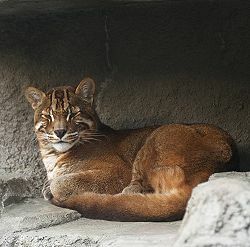 〈Molecular genetic characterisation of two insular Asian cat species, Bornean bay cat and Iriomote cat〉. S.P. Wasser. 《Evolutionary theory and processes: Modern perspectives, Essays in honour of Eviator Nevo》. Dordrecht: Kluwer Academic Publishing. 223–248쪽. 이 문서는 2018년 11월 20일 (화) 00:48에 마지막으로 편집되었습니다.